The ever-present nature of the Smart Device is only clarifying the need to utilize the tools even more. It's not enough to simply have one of these tools, it is more important than ever that we maximize their usage and utility. "Keep your BlackBerry out of bed." 1. Use the tool during the day, turn off the access for those 4 or 5 or 8 hours when you're going to relax, refresh, and reboot. 2. Get different technology for your nightstand. I still highly recommend you invest in MyZEO. It will give you information that may change (or save) your life. 3. Use that smart device (Blackberry, iPhone, Droid, iPad, etc) to its full capability. 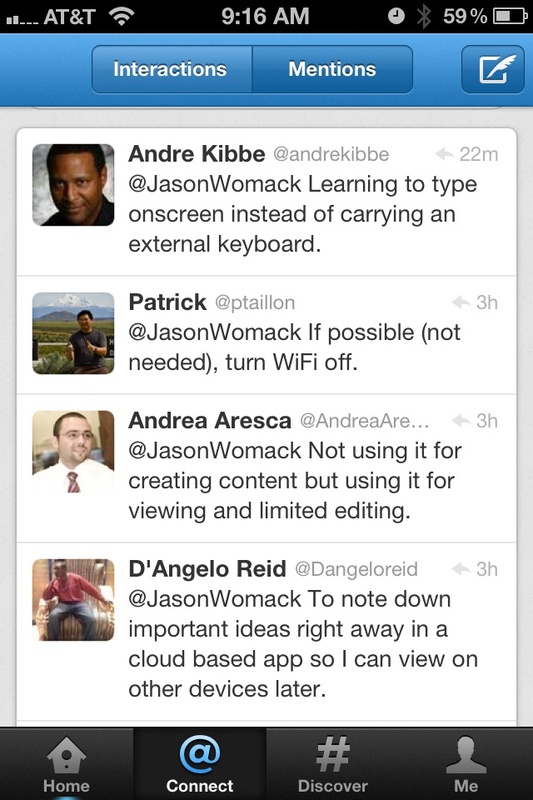 (I've made some videos, if you want ideas: http://www.youtube.com/jasonwomack ). Bottom line, identify ways you could be using that tool more effectively and experiment with those ideas. It seems from time to time that just the right information comes in and just at the right time. This is what happened last week when I met up with Josh Linkner of Detroit, MI, a new-to-me author friend who shared a copy of his book with me after our brief chat. "Someone should do something about this..."
When there's that thought that things need to be different, or you're in a position to think critically, that's the time to engage...with everything you've got. By the way, thinking critically is not the same as criticizing. I define critical thinking as the ability to think THROUGH to the next now. I write it down, that thing that I wish were different, and then I pick a date. To think it through, I pick a date around 6-18 months in to the future. Next, write down what that thing would look like if it were, indeed, a bit different. What would it sound like? What would it feel like? The more detailed you can be, the better. Now, some of you might stop there. This is where it actually begins for me. Instead of just backing up from there, to identify some actions that might help you get moving in that direction. What I do, is move out in to the future...add another 6-18 months and THEN project out to what life would look like if what you achieved that goal. If you get a chance, check out Josh's blog (it's easy enough to find him online, just type his name into your search engine of choice). How many of you present for a living - you know, you get in front of someone, a team, a group or an audience and talk for a while? Maybe it is just a few moments at a local business networking event, or a large auditorium where you share ideas and possibilities. Well, you know that's what I do... All the time. Just this month, I have spoken in front of 7 audiences; over 300 people have heard me talk about the best getting even better. Now, I always ask for people's feedback on the presentation (generally a highly interactive, 5-7 hour program at an off-site venue for employees to think about what they think about and - most importantly - just HOW they think). I take pride in my presentation abilities and experience of having spent the past 16 years studying human performance. So, when I saw a feedback form yesterday where a participant rated me a "4" presenter (on a scale of one to seven) and his comment was, "...the day was abstract, no concrete value," you can probably imagine how I felt/feel. I will do what I can to NOT dwell on that negative experience (by the way, 60+ other people rated the seminar a 6/7 or 7/7 and comments were the opposite of what that one older gentleman wrote). I did however spend time to look up the word "abstract." thought of apart from concrete realities,specific objects, or actual instances: an abstract idea. Yeah, I'll say it out loud for myself: That is 180 degrees opposite of what I offer. So, my question to that participant - and what I believe I'm going to ask people to think of in the pre-work assignments and early part of the live sessions - "What are you expecting from what you're walking in to?" I'm realizing my own responsibility in stepping up to make things better (chapter 1 of the book). If something is not matching the well-developed, objective and shared expectations, it's up to ME to make things better. Where could you apply this question successfully?